Blue and white Delft is the most familiar type of Delft pottery, but other classic variations are polychrome (multi colored) Delft and sepia Delft. Sepia can be defined as a dark brown-grey color named after the brown pigment from the ink sac of the common cuttlefish or "Sepia". 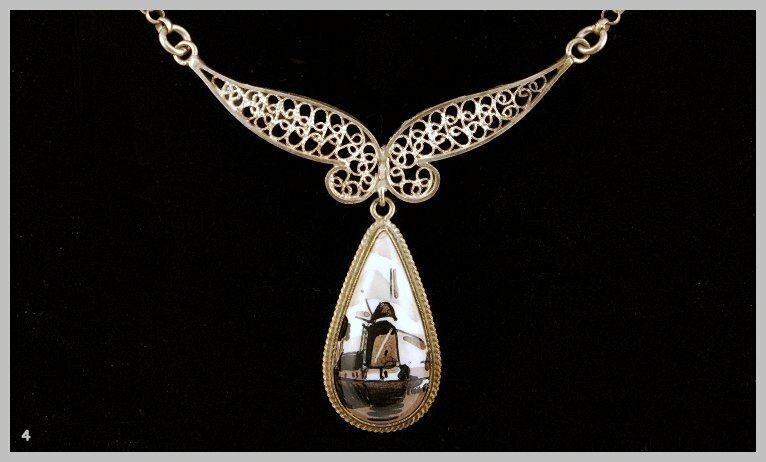 Although the color of our permanent sepia exhibition fits nicely in that description, the name sepia is often used for Delft decorations showing shades of greyish purple. "The Sepia Collection" was discovered by chance during a research visit to "G.J. van den Bergh Zilverwerken" of Schoonhoven, the Netherlands. The Van den Bergh Company was founded in 1948 by G.J. 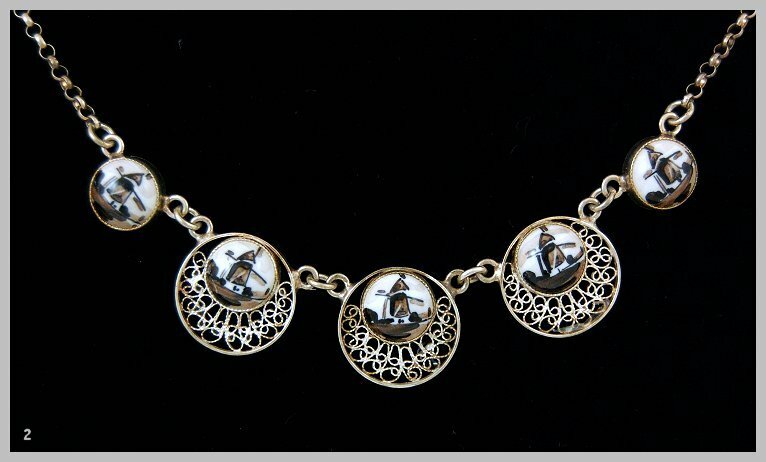 van den Bergh Jr, and became a leading producer of Delft silver filigree jewelry after WW2. It also was one of the main customers of the Verwoerd Ceramics Studio in the 1950's. 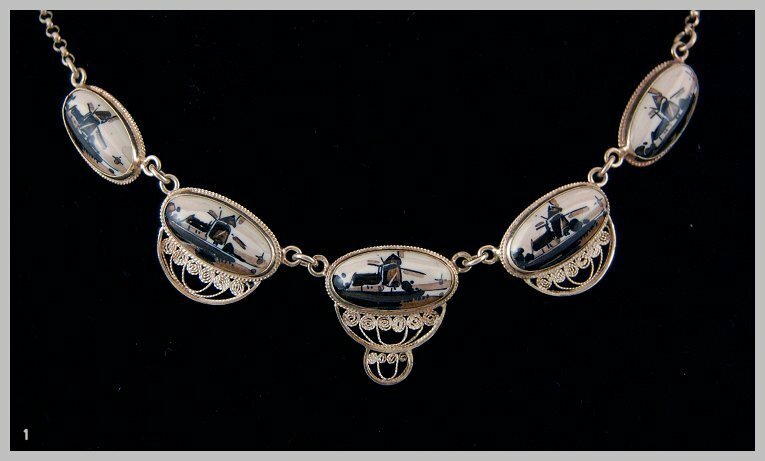 In November 1953 Verwoerd produced a few dozen Sepia samples for Van den Bergh, who in March 1954 ordered a full set of all popular models and sizes in order to create a new Sepia jewelry collection for a foreign customer. 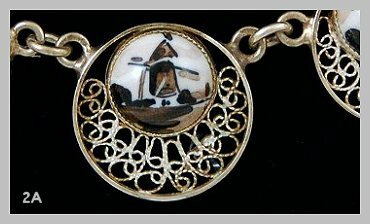 Evidently, most of the jewelry was sold, but they nevertheless remained the only Sepia windmill medallions Verwoerd ever produced. 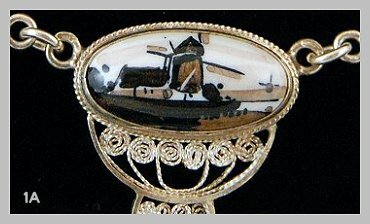 What has been preserved of this extremely rare jewelry collection emerged in 2009, after having been hidden in the Van den Bergh vault for 55 years. The character of the paintings is dramatically different from that of the blue and white windmill sceneries. They remind us of a wash pen and ink drawing. We believe that this is not a coincidence. Verwoerd did some sepia paintings - topographical tiles in particular - when he worked for Zenith Gouda. One of the known samples shows a distinct water color style. It is true, nevertheless, that sepia is better suited for the pen and ink approach, and that a similar effect could not have been reached using the customary blue Delft shades. 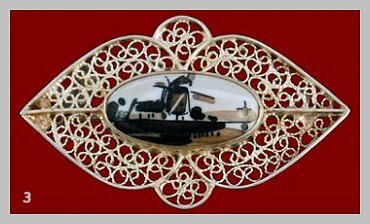 In the picture gallery below, #1 is a silver filigree necklace showing five oval medallions OL10x20 (from a total of 67 sepia medallions produced), #2 is a silver filigree necklace with five round medallions C10.5 (101 sepia medallions made), #3 is an OL10x20 silver filigree brooch, and #4 is a silver filigree lavalier pendant featuring a TD13x26 teardrop shape (only 8 sepia pieces made). Some of the medallions show a late "Three Stones" signature (#4A), others already have a plain "Delfts" signature, which serves to illustrate that the 3-stones signature was replaced by a plain Delfts signature in late 1953 or early 1954. 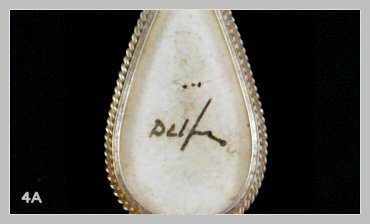 For an explanation of the 3-stones signature see The Compact Guide To Delft Jewelry Signatures.